MANUFACTURER: PFIZER CONSUMER. 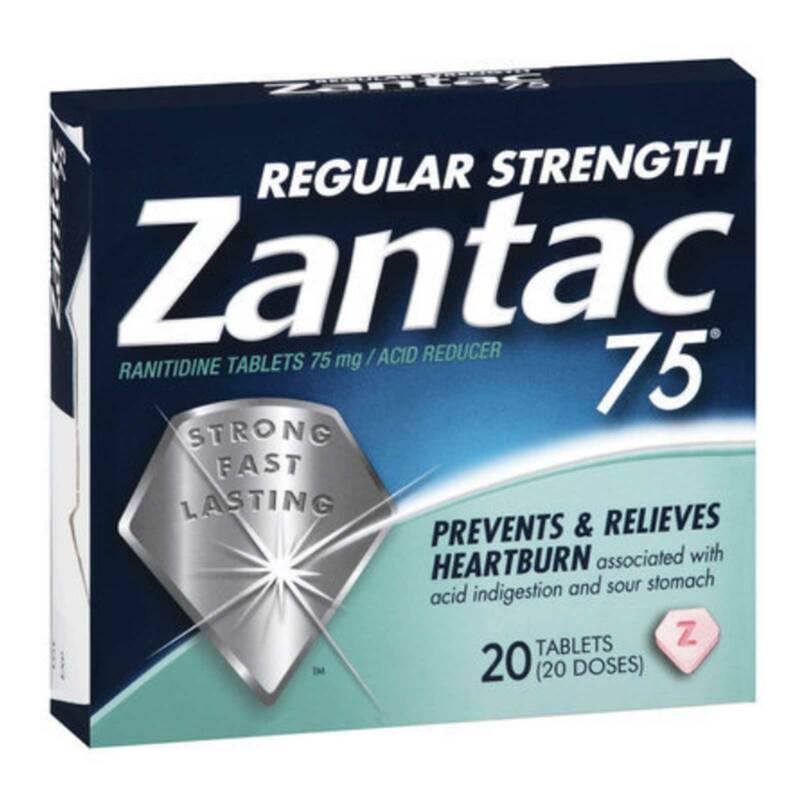 INDICATIONS: Zantac 75 Tablets Relieves heartburn associated with acid indigestion and sour stomach. Prevents heartburn associated with acid indigestion and sour stomach brought on by certain foods and beverages. INGREDIENTS: Active Ingredients: Per Tablet: Ranitidine 75 mg (as Ranitidine Hydrochloride) 84 mg. Inactive Ingredients: Hydroxypropyl Methylcellulose; Magnesium Stearate; Microcrystalline Cellulose; Synthetic Red Iron Oxide; Titanium Dioxide; Triacetin. DIRECTIONS: Adults and children 12 years and over: To relieve symptoms, swallow 1 tablet with a glass of water. To prevent symptoms, swallow 1 tablet with a glass of water 30 to 60 minutes before eating food or drinking beverages that cause heartburn. Can be used up to twice daily (up to 2 tablets in 24 hours). Children under 12 years: ask a doctor. WARNINGS: Allergy alert: Do not use if you are allergic to ranitidine or other acid reducers. Do not use: if you have trouble swallowing; with other acid reducers. Stop use and ask a doctor if: stomach pain continues; you need to take this product for more than 14 days. If pregnant or breast-feeding, ask a health professional before use. Keep out of reach of children. In case of overdose, get medical help or contact a Poison Control Center right away.